Why it matters: Intel's first step to mitigate its 14nm supply constraint is starting to take shape and a smart decision has been made, indicating that someone at Intel is actually at the wheel. Struggling to keep up 14nm wafer supply due to its 10nm train wreck, Intel is taking the first measures to stave off the silicon shortage, it seems. Intel has picked a high-volume silicon part to manufacture on a different process, and is currently in the first stages of shipping out the chipset. Having undertaken the first step of dialing back volume silicon to the 22nm node, relieving the tight supply on 14nm silicon, the first chipset going "big" is the H310. The decision is quite understandable as the original H310 is the simplest and lowest-end chipset for Intel's 8th (and 9th, we're told) generation Core CPUs, and is used extensively in a high-volume of office and consumer PCs, due to the lower requirements for on-board communications and limited expansibility. It's cheap and cheerful and it's taking up 14nm capacity which Intel cannot afford. According to sources in China, the first offspring of this decision is dubbed the H310C chipset, depicted below. H310C (on the left, 22nm) v. H310 (on the right, 14nm). The sizing differences are clear. The H310C chipset carries sSpec SRCXT and reportedly measures 10mm x 7mm, while the 14nm H310 (sSpec SRCXY) measures just 8.5mm x 6.5mm. The original H310 design was rated for 6W TDP, but this is not expected to change much, or impact OEM designs at any stage. 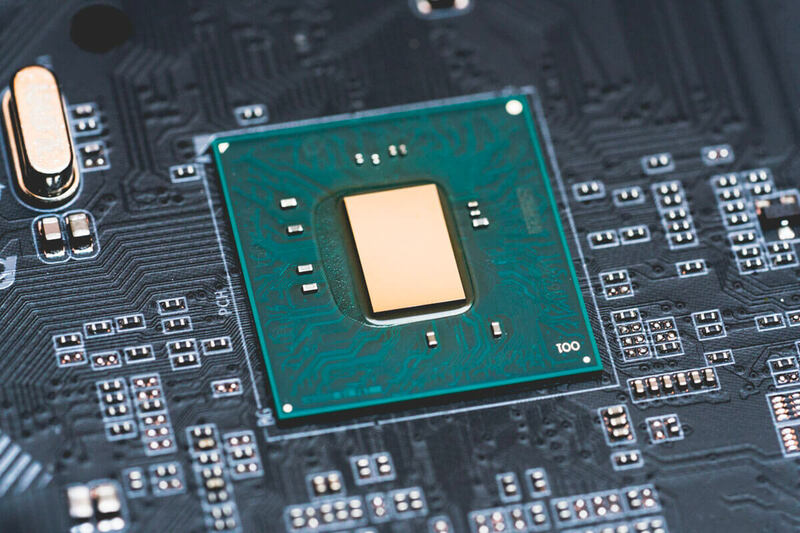 In fact, it might bring more options to system manufacturers as, in an unlikely side-effect of the current state of driver development, this also means Intel is bringing back support for Windows 7 on H310C. While consumers and businesses will be oblivious to the new chipset, it will have a dramatic effect overall for Intel, we believe. At the end of it, we're happy to hear Intel isn't completely zoned out of the manufacturing side and someone there knows what they're doing. Hopefully this will bring about slightly lower Intel CPU prices as supply meets demand. Maybe Intel will also bring back Mark Bohr's videos.